You put an adult trauma call out and start preparing for the patient. You feel a bit like you have taken the blow yourself, but preparation is key, so get ready. Its 2 am, they are in an unfamiliar environment (resus) and are often relatively junior! Significant bleeding (and I mean significant!) from Le Fort and mandibular fractures can obstruct the airway. The blood supply to the face comes from the sphenopalantine and greater palatine arteries (branches of the external carotid artery) as well as the anterior and posterior ethmoidal arteries from the internal carotid artery (that supplies the nasal cavity). Thats a lot of arteries leading to a lot of bleeding! There will likely be oedema to the soft palate from the mid facial fractures. The patient may also have a traumatic brain injury rendering him unable to self maintain his damaged airway. My advice is to get your difficult airway trolley into the resus bay. OK, your trauma team is present and the patient is wheeled in. If he is awake and you are not concerned over a cervical spine injury, sit him upright and forward to allow for postural drainage of the torrential blood flow. Keep him like that until the induction drugs go in, then lie him flat. What if you are concerned about his C-spine? He comes in supine,with three point immobilisation of his cervical spine. There is a lot of blood. His airway is obstructing. What can you do?. Can or should you sit him upright and risk worsening any potential C-spine injury? If you don’t do something his airway will obstruct. Take the blocks and tape off and turn him to a left lateral position. This still maintains some immobilisation and also allows for drainage of blood. 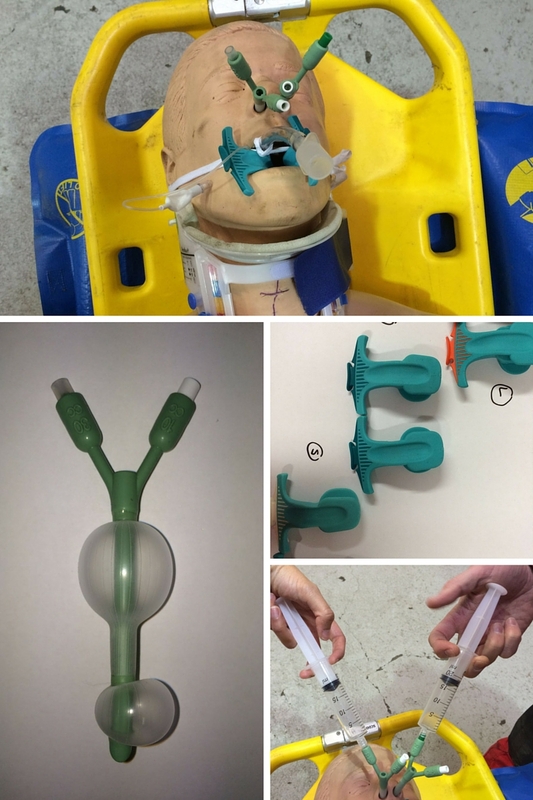 Get two suction units and remove the rigid yankeur from the end and just use the tubing itself to control the bleeding if it is torrential. How can you diagnose, by examination only, if the patient has a Le Fort fracture and which one he has? Stand on the patients right hand side. Place your left hand on his forehead to stabilise it. With your right hand, hold the upper teeth and anterior maxilla and gently rock the hard palate. Its a transverse fracture of the maxilla at the level of the nasal fossa. There is separation of the body of the maxilla from the pterygoid plate and nasal septum. Only the teeth and hard palate move. Its a pyramidal fracture through the central maxilla and hard palate. The hard palate and nose move, but not the eyes. There is craniofacial dysjunction. The entire face is separated from the skull. The fracture line runs through the frontozygomatic suture line, the orbit and base of the nose and ethmoids. The whole face moves. Is a Le Fort III along with a fracture to the frontal bone. Radiopaedia have an excellent blog on the different classifications with great 3D pictures which I really suggest you read. Le Fort I is a floating palate, Le Fort II is a floating maxilla and Le Fort III is a floating face! In all cases, you can help stop the bleeding by also grabbing the upper incisors and pulling the mid face forward as a temporising measure to disimpact the maxilla. Back to the case in question: you have now you have diagnosed the patient with a Le Fort III and it is continuing to bleed..
Allocate roles (have a very low threshold to phone the boss on this case). Set a target oxygen saturation level, that if the patient desaturates to below this you are going to tell whoever is intubating to pull out and ventilate again. Mark on the neck where the cricothyroid membrane is, just incase you get into a cant intubate, cant ventilate situation (CICV). Have the surgical airway kit out and open. Read this for revision. Go through the RSI checklist. Have the DAS failed intubation algorithim to hand. Listen to HEFT EM Cast for a refresher! I would have the IGEL or LMA out of the packet ready to insert if needed. Remember Igel size +3 = size of ETT that can be passed through Igel. Realistically if you’re using a size 4 Igel, a size 7 ETT is too tight. Go for a size 6 ETT- bearing in mind you would need a size 10Ch Bougie not the normal 15Ch one! Get two suction units ready and remove the rigid yankeurs (they tend to get blocked with clots too easily otherwise) and check there is enough battery power in them. Get your video laryngoscope ready before the RSI (if you are lucky enough have one). Now there are various options on how to intubate this patient. They depend on the time of day, what available staff there are (eg ENT) and what available kit you have. Awake direct laryngoscopy with intubation. LIFTL has a great post on the pros and cons of each. Lets say the patient is hypotensive and becoming more unconscious, you’ve put out a code red and are pre-loading him with blood. I would use a reduced dose of fentanyl (1mcg/kg) with ketamine (1-2mg/kg- as it gives sedation and preserves the respiratory drive) and rocuronium (1.5mg/kg). I appreciate there may be some arguments about that. Im not a fan of propofol especially in the unstable trauma patient! Phew! It all went according to plan and the patient is now intubated! Before you start high-fiving everyone, you need to think about how to control the bleeding. It just so happens that your trauma unit has a max fax theatre, which is used once a week for local elective cases. You need to get a pair of epistats and some bite blocks and a semi rigid cervical collar. An Epistat (bottom left picture) is a nasal catheter which has an anterior and posterior balloon. They are inserted in the same way as a nasopharyngeal airway, along the floor of the nose. The posterior balloon holds 10mls of saline and the anterior balloon holds unto 30 mls. The key to success is inserting an epistat into each nostril first before inflating the balloons. Then simultaneously inject the balloons with saline ( using two people is easier than one person using both of their hands). The mandible is stabilised on top of the semi-rigid cervical collar. The hard palate is held in place against the stable mandible by the bite blocks (top right picture). The maxilla is fixed in position by the epistats. Insert the epistats, like a nasopharyngeal airway, along the floor of the nose. Don’t inflate the balloons yet. Insert the bite blocks either side of the ETT. There is a groove on them that the ETT should sit next to. Apply the C-spine collar. (Remember it has been undone for the RSI). Inject 10 mls of saline to the posterior balloon (white port) of each epistat simultaneously, otherwise you risk disruption of the fractures. Inject up to 30mls of saline to the anterior port of each epistat (usually green) again simultaneously. I would do this 10mls at a time until haemorrhage control is achieved. Now you have done all you can to stabilise the patient and transfer on for a CT scan or to the nearest MTC. Your can finally give yourself that deserved high five. Maxfax injuries can have torrential bleeding. Preparation for the intubation is key. Keep the patient upright if they are conscious or in a left lateral position to allow postural drainage. Team work and good leadership are important. Take time if you need to enable yourself to take control of the case and reset everyone before the intubation, so they are all on the same page as you. Know how to pack the face after the intubation. Remember to inflate the balloons of the epistat simultaneously only at the end.